Packages to Fernando de Noronha and Porto de Galinhas, Brazil . Porto de Galinhas is a great beach resort near Recife and an ideal place to include on your Brazilian itinerary when visiting Fernando de Noronha. Get the tip from our local experts, learn about the package options to Noronha before you go. Around 80 km(49,7 miles) from Recife, and 75 km(46,6 miles) from Olinda, the village of Porto de Galinhas which can be reached by car or bus is quite different from the big Brazilian cities and towns. Originally, just a fishing community, the village has developed into a tourist destination, mainly due to the several beautiful beaches in the area. Literally translated, Porto de Galinhas means “Port of chickens”. This curious name refers to the code word used by those who illegally pursued the slave trade even after it was abolished. Whenever ships carrying slaves arrived at the port, slave masters would be informed that new “hens” had arrived. Porto de Galinhas is therefore a port that played a significant role in the history of slavery.Even after slavery was abolished those who illegally continued the practice were informed of new arrivals of slaves at the port on hearing the code. Each beach near Porto de Galinhas has something different to offer. Muro Alto or “High Wall” is so named because of the high reef wall which presents itself some 50 m from the beach. Diving and snorkeling are good here and during low tide, the calm waters of ocean pools allow for various water sport activities. Most luxury resorts including Nannai and Summerville are located in this area. Cupe beach has dense mangroves where nature lovers can avail of hiking or kayaking tours, while in contrast Gamboa or “clear waters” is a secluded, almost desert like beach, with palm and calm waters, ideal for bathing or just taking in the sun. Maracaípe offers great surfing opportunities and is host to surfing and kite-surfing competitions, while the Pontal de Maracaípe where the ocean and river meet provides the right conditions for boat rides and to enjoy picture perfect sunsets. Toquinho beach is where the water of the river Sirinhaem meets the ocean, resulting in a display of several colors. From here trips can be made to the island of Santo Aleixo, considered to be the best diving spot in this region. Divers should also visit Serrambi beach, where the opportunity to do shipwreck dives is possible. A visit to the Engenho Gaipio sugar mill will give visitors an idea of how people lived in this region in the 19th century. The well preserved house contains furniture and artifacts from the era and was witness to one of the Praiera Revolution battles. 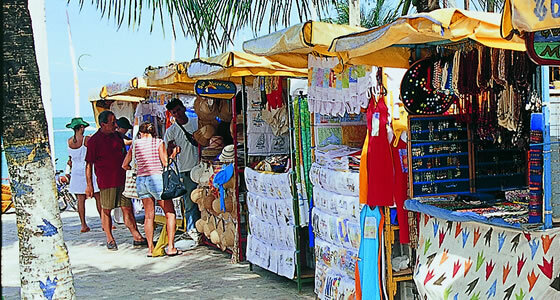 Porto de Galinhas has several stores selling handicrafts local to the northeastern region.